Capital of New South Wales, Australia. Its congregation dates from 1817, when about a score of Jews formed a ḥebra ḳaddisha, and they obtained permission to bury their dead in a special corner of the general cemetery. Eleven years later prayer-meetings were held in the house of P. J. Cohen. About 1830 the chief rabbi of London, Solomon Herschell, sent Aaron Levi, member of the bet din, to assist in consolidating the congregation; and in 1832 a synagogue was established in a rented room. J. B. Montefiore, who had previously obtained a grant of land from the government for a Jewish burial-place, became the congregation's first president. The first Jewish marriage in Australia, that of Moses Joseph, took place in 1830; and in the following year a certain Rose was engaged as the first minister. He was followed by Jacob Isaacs. The Jews of Sydney then acquired a synagogue of their own in York street, which was opened for divine worship on April 2, 1844. In 1862 A. B. Davis, born in London in 1828, who had been minister at Portsmouth and Kingston (Jamaica), became senior minister of the congregation, serving for no less than forty-one years, during which period he helped to create several of the communal institutions, e.g., the Sabbath-school and the education board. During his incumbency, also, the present synagogue, the hand-somest building of its kind on the Australian continent, was built in Elizabeth and Castlereagh streets and dedicated Jan. 26, 1875. In 1905, on his retirement as rabbi emeritus, F. L. Cohen was selected to succeed him. Almost a plethora of charitable institutions has arisen in Sydney. The oldest is the Hebrew Philanthropic Society, which was founded in 1833. In 1882 it was converted into a home and styled the "Sir Moses Montefiore Home." Accommodations are provided for about fifteen inmates; meals are furnished to casuals; aid is granted monthly to old men; and general relief is afforded to the poor and needy. The Dorcas Society, whose usefulness is confined entirely to women, was founded in 1840. On similar lines the Help in Need Society was formed in 1898; its operations are more limited. A society that is doing a great amount of good is the Jewish Mutual Aid, founded in 1896 by A. Blashki, Jr. It is purely a loan society, lending at interest sums of not less than £25. The Baron de Hirsch Memorial Aid Society, an institution for the general relief of the poor, was founded in 1896. In 1894, with a view to enlisting the sympathy and help of the young, a society, known as the Jewish Girls' Gild, was formed by S. A. Joseph; and in 1897, through the instrumentality of Henry Harris, another ḥebra ḳaddisha was formed. A year later a ladies' section of the society came into existence under the direction of a Mrs. Samuels. As in most Australian congregations, Sydney possesses a branch of the Anglo-Jewish Association. Since its foundation (1872) this branch has been presided over by A. B. Davis. Many leading Jews of Sydney have displayed an interest in communal matters, including S. A. Joseph, L. W. Levy, and Charles Collins, M.L.H. The first-named reached New Zealand on the first ship to arrive at that colony from England in the year 1842. Subsequently he settled in Sydney, where he joined Jacob Montefiore and formed the firm of Montefiore, Joseph & Co. For nearly a quarter of a century he was a member of the synagogue board of management. Charles Collins was for many years the leading citizen of the district of Narrabri. He was its first mayor, and he held that position for three successive years. In Parliament he sat as the representative of Namoi from 1885 to 1887 and again from 1890 till his death in 1898. L. W. Levy occupied various official positions, including that of member of the legislative council in 1882. Of the other leading Jews the name of J. G. Raphael must be recorded. Several streets in Sydney perpetuate his memory. From 1872 to 1878 he represented West Sydney in the legislative assembly. In the same body J. J. Cohen was elected a member for Petersham in 1898. In no city have the Jews borne a more praiseworthy part in the development of commerce and trade, in the growth of institutions, and in the administration of public affairs than in Sydney. The example set by the Montefiores was followed by other early settlers, including Louis Phillips, P. J. Cohen, and Samuel Cohen, the last of whom was the first Jewish member of the Parliament of New South Wales. The election of George J. Cohen, Richard Gotthelf, and other Jews to the position of president of the chamber of commerce bears testimony to services rendered in the sphere of commerce, while Sigismund Hoffnung and David Cohen were prominent as merchants and philanthropists. 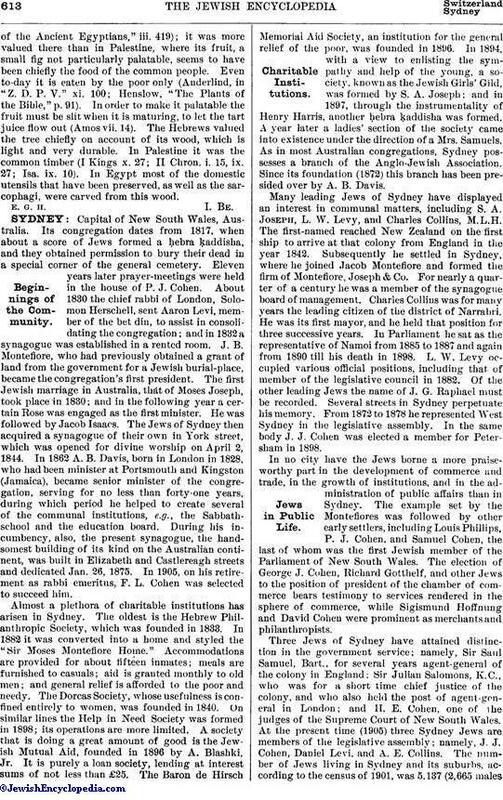 Three Jews of Sydney have attained distinction in the government service; namely, Sir Saul Samuel, Bart., for several years agent-general of the colony in England; Sir Julian Salomons, K. C., who was for a short time chief justice of the colony, and who also held the post of agent-general in London; and H. E. Cohen, one of the judges of the Supreme Court of New South Wales. At the present time (1905) three Sydney Jews are members of the legislative assembly; namely, J. J. Cohen, Daniel Levi, and A. E. Collins. The number of Jews living in Sydney and its suburbs, according to the census of 1901, was 5,137 (2,665 malesand 2,472 females), in a total population of 488,382. Intermarriages with members of other religions have been very frequent among the Sydney Jews, about one-fifth of the men having taken wives not of the Jewish faith. 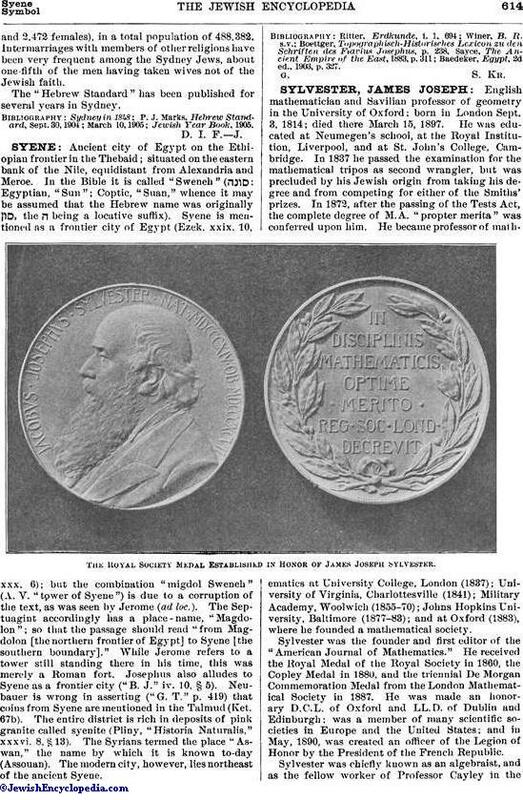 The "Hebrew Standard" has been published for several years in Sydney.